When Print2RDP is combined with the ColorPlus Printer Driver, Terminal Server users can convert any printable document into editable, ready-to-publish HTML with text, pictures, graphics, and styles, and store the output directly on local client machine! 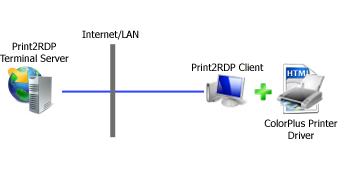 Once connected to the Print2RDP Terminal Server, Print2RDP will create a virtual printer driver for the ColorPlus Printer Driver. When the output format is selected as 'HTML - editable', the print job will result create an organized directory on the local workstation with HTML files, CSS stylesheets, and images. ColorPlus Printer Driver - the ColorPlus Printer Driver now includes a self-contained HTML printer driver for creating editable HTML files from any printable document. The ColorPlus driver also includes every available output format. Color Printer Driver - the Color Printer Driver also includes the self-contained HTML driver, however a few key file formats such as PDF and EMF are not supported.